WOLFRAM HÖLAND, PhD, is the Head of the Department of Research and Development, Inorganic Chemistry Technical Fundamentals, at Ivoclar Vivadent AG, Liechtenstein. He is also a Lecturer in the Department of Inorganic Chemistry, Eidgenössische Technische Hochschule (ETH Zurich) in Switzerland. Dr. Höland is the recipient of several awards, including the Wöhler Prize of the German Chemical Society and the Turner Award of the International Commission on Glass. GEORGE H. BEALL, PhD, received his PhD in geology from MIT in 1962 and was a Research Fellow in the Science and Technology Division of Corning Incorporated, Corning, New York. 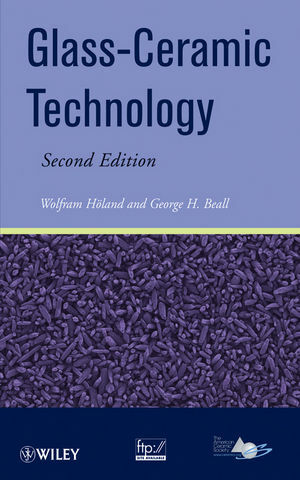 Until 1995, Dr. Beall was a Courtesy Professor in the Department of Materials Science and Engineering at Cornell University, and has authored or coauthored approximately eighty technical papers and one book, and holds more than 100 U.S. patents.